To meet a deadline, I completed the text of the Kindle eBook Tennis Matters with a few last minute corrections. and sent it off to Amazon. The time was approximately 3pm BST in the afternoon of August 14th, 2015. Within an hour, news broke that the volatile 20 year old was facing suspension as well as a hefty fine for a grossly offensive and obscene remark aimed at his opponent. My corrections had been about the match I had watched live overnight. The title and general positive tone of the short amendment were both overtaken by events. Bad weather had delayed the match deep into the evening. A close first set went to a tie break. This was again tightly contested. Kyrgios was keeping his demons bottled up. At 9-8 in the breaker, an incorrect line call threaten to release them. Kyrgios had a brief explosion of emotion at the change of ends at 9-9 with his racquet skittling across court. A brief exchange of views with the Umpire followed. Kyrgios appeared to have gained control of himself, but nevertheless quickly lost the set. Now playing with more control but simmering resentful energy, Kyrgios demonstrates his power and potential. He outguns his higher ranked opponent and wins the set 6-3. The injury may weaken the case for declaring the victory complete evidence of the arrival of the next superstar. But the match suggested to me that Kyrgios will be able to deal with his chimp as he takes on the best players in the world. 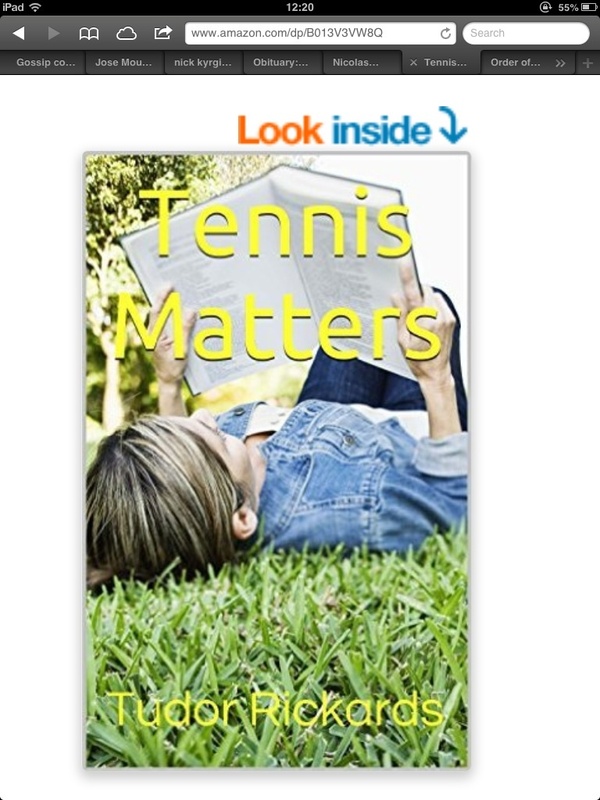 Before the first edition of Tennis Matters had gone through the few hours required for Kindle Direct publishing, it was already out of date. I am planning a second edition as soon as possible. The main change will be to amend the title and the ending to the story of the Kyrgios Wawrinka match. During the following week, Kyrgios apologized and then sensibly kept quite as the media storm burst. Calls for further sanctions have begun. It has been suggested that the Australian tennis administration faces a dilemma regarding his inclusion in next Month’s Davis Cup semi-final against Great Britain. This entry was posted on Saturday, August 15th, 2015 at 2:13 pm and is filed under Uncategorized. You can follow any responses to this entry through the RSS 2.0 feed. You can leave a response, or trackback from your own site.